One of my favourite ways to make money is by using things I already have. That means no start up costs, no fees, no risk. If you have a quick look around, you may ask yourself how you can possibly make money with what is around you, but with a little creativity you will see it is not so hard. If you are a young couple in a two bed property, elder parents whose kids have gone off to uni, or simply have a spare room at home, renting it to a local student or worker can be an easy way to generate extra money. Even better, as a live in landlord, you can earn up to £4,250 tax free each year for renting an unfurnished room. It may not be to everyone’s taste, but £4,250 is a lot of money! Just make sure you define the living arrangements clearly so everyone can live in harmony. There are dedicated sites where you can get a quote and see how much your old phone or laptop would go for. No matter whether it is in working condition or totally broken. Some will even buy your chargers or accessories. After all, chances are you won’t ever use that old phone again. The same way you can rent an extra room, if you have a spare parking space you could turn it into an extra source of income. A quick ad on your local Gumtree or ad board should get you a few prospects, or even local workers interested in renting your space during office hours only, so you can come home after work and park yourself. Renting your car on a peer-to-peer website or using a rideshare company to drive people and make a little money is somehow less conventional, but those sites are really picking up and it looks like it is going to be the next trend of the sharing economy. As a rule, I recommend no keeping in your house items you haven’t used in a whole year. 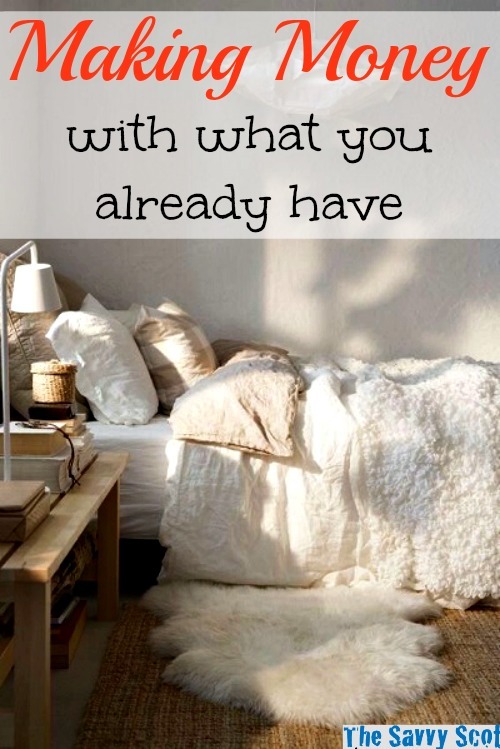 You always think “what if”, but after a few years, all that clutter is doing you no good. So how about a thorough exploration of your home to get rid of everything you haven’t used in ages? You can look up a nearby car boot sale by asking the council or checking the local ads, and that’s extra money in your pocket to buy stuff that you will actually use. Sometimes people look around and say ok, I don’t have a spare item to rent or sell, so I have no ways to make extra money unless I invest and buy products to sell. How about your skills? Maybe you speak a foreign language, maybe you love kids or dogs, maybe you’re really good at baking birthday cakes.. Whatever it is, it should be easy to turn it into a marketable skill. Just think about what you enjoy doing. Playing tennis? How about teaching a few kids at your usual club? Gardening? Can you give that elderly neighbour a hand with her roses? Maybe you know how to prune azaleas, if not you can always learn! It may not be a lot of money but at least the hours should be flexible and time flies when you are doing something you love. I like your post. You inspire and educate us on your blog about this Making money with what you already have. You can really help a lot. Great blogs! I am always looking for new ways to creatively save and make money with no start up costs. Thanks so much for the ideas! I will be looking around my house today to see what I can sell. Great post! We try to have an annual yard sale to rid our home of things we don’t use and make some money. I also sell surplus produce from my garden every year, which brings in a little bit of extra money as well. There are so many ways to make money only with what you already have. I enjoy propagating plants and often sell the plants I don’t use at my garden gate for some very handy pocket money. Extra cash is always good! Plus, there’s no real effort involved. Nice ideas. Will need to sit hubby down and get creative. There are always ways to hustle up money when you need it badly … excellent post!